Executive Summary: On November 2, 2004, American voters will decide whether George W. Bush gets four more years in the Oval Office or is replaced by Someone Else. Given our two-party duopoly, that Someone Else could only be John F. Kerry, or as he has been billing himself lately, “JFK.” Which of the two candidates should Chinese Americans support? That depends on whether you believe in our so-called “Two Party System.” I don’t, so my answer is going to differ from other Chinese Americans’, most of whom endorse mainstream political ideas and candidates. They were standing under a tree, each with an arm round the other’s neck, and Alice knew which was which in a moment, because one of them had “DUM” embroidered on his collar, and the other “DEE.” ‘I suppose they’ve each got “TWEEDLE” round at the back of the collar,’ she said to herself. I am a libertarian with a small “l,” an unapologetic libertarian hardliner. I don’t. I consider a vote cast for either of the two major parties a wasted vote. Ralph Nader and the late George Wallace were right. There isn’t a dime’s worth of difference between the Democratic and Republican parties. Neither the Democratic nor Republican party comes remotely close to advocating the America I have in mind. The America I have in mind doesn’t inflict tyranny on its citizens. The America I have in mind defends hapless American citizens against ever more flagrant US government tyranny. The Democratic and Republican parties aren’t really two distinct political parties. They’re more like the liberal and conservative wings of America’s Demopublican (or Republicratic) One Party System. The “choice” they offer the American public doesn’t amount to a real choice. 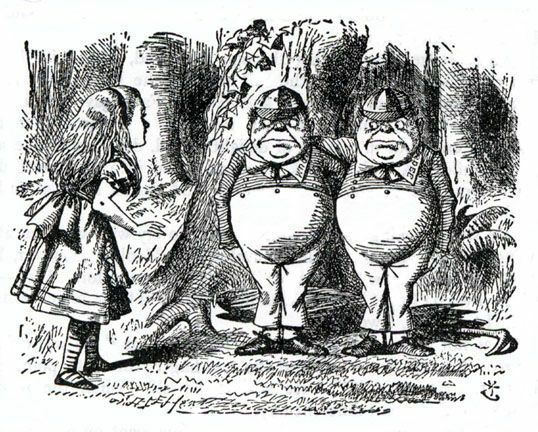 The candidates they foist on the American public every four years are Tweedledum and Tweedledee. Or perhaps given Dubya’s historic low IQ for an American chief executive, Tweedledum and Tweedledumber. Besides, as the old joke goes, “No matter whom you vote for, the government always gets elected. That is the real problem, and it is not the least bit funny. Having said all that, I would agree that in the critical area of foreign policy Bush is the greater of two evils, and Kerry the lesser. So, yes, I will probably be a little less unhappy if on November 2 Kerry edges out Bush. This Bushism, translated into plain English, means the Bush II regime would resort to any means, however despicable, to undermine China’s political sovereignty and territorial integrity. Bush II administration foreign policy is based on the demonstrably false premise that civilizational progress is a social Darwinist zero-sum game in which one nation’s gain is another nation’s loss. The Neocon neoimperialists responsible for Washington’s international policy insist that for America to win, everyone else must lose, that America can remain rich and strong only as long as other nations remain poor and weak. Correction: as long as other nations can be kept poor and weak. The 9-11 catastrophe and Iraq War II forced Dubya to modify his paranoid stance against China, ever so briefly. Since Chen’s fraudulent “re-election,” however, Dubya has reverted to form as the capo di tutti capi of the most virulently crypto-racist, anti-Chinese criminal enterprise in modern memory. 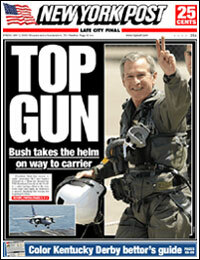 Are Chinese Americans right to be concerned about Bush II administration hostility toward China? Are Chinese Americans being disloyal to America if they concern themselves with the well-being of China? Not unless Irish Americans are disloyal to America for concerning themselves with the well-being of Ireland. Not unless Jewish Americans are disloyal to America for concerning themselves with the well-being of Israel. Among those most concerned about the well-being of Israel are Bush II regime Neocons of Jewish descent. If they are not disloyal to America for concerning themselves with the well-being of Israel, then Chinese Americans are not disloyal to America for concerning themselves with the well-being of China. Recent US history shows that every time unprincipled politicians demonize China, Americans of Chinese descent suffer. The term “unprincipled politicians” is probably a redundancy. Lee Wen-ho is the most prominent example, but all Americans of Chinese descent are at risk. During the EP-3 spyplane incident in Hainan Island, a white supremacist National Review Online columnist and numerous white supremacist radio talk show hosts demanded that Chinese Americans – not citizens of the PRC mind you, but American citizens of Chinese descent – be rounded up and herded into Manzanar-style concentration camps. Are Americans of Chinese descent within their rights to be concerned about virulent Bush II administration animosity toward China? You’re damned right they are. JFK II: The Lesser of Two Evils? George W. Bush, true to Chickenhawk form, avoided fighting in the Vietnam War even as he demanded that the Vietnam War be fought. Bush wrangled himself a position in the Texas Air National Guard where he defended the Gulf coast of Texas against the looming threat of an amphibious invasion by Fidel Castro and Che Guevara. Three decades later, Commander in Chief of the Armed Forces of the United States, now president Bush emerged from his Saddamite hardened bunker in Nebraska long enough to impersonate Tom Cruise in a scripted “Top Gun” photo op. John F. Kerry, by contrast, fought in the Vietnam War even as he fought against the Vietnam War. JFK II earned a Bronze Star, a Silver Star and three Purple Hearts commanding a Swift boat in Vietnam. Even if it turns out that the allegations in the anti-Kerry expose “Unfit for Command” are true, JFK II remains less unfit for command than King George II. Combat veteran Kerry, unlike Chickenhawk Bush, actually fought in a a real war. Combat veteran Kerry, unlike Chickenhawk Bush, was actually wounded by real shrapnel. Combat veteran Kerry has to be more aware than Chickenhawk Bush of the potential consequences of yet another misguided Asian military adventure. Will all this be reflected in Kerry’s foreign policy, specifically Kerry’s China policy? The Kerry election committee and the Democratic Party have specifically omitted any mention of the Taiwan Relations Act from their party platform. Put a check mark in the Kerry column. Kerry even floated a trial balloon about urging Taiwan to accept Deng Xiaoping’s long-standing offer of One Country, Two Systems. Put another check mark in the Kerry column. Then remove it immediately because this eminently reasonable proposal was timidly and hastily withdrawn. Would a Kerry administration feel vulnerable to McCarthyite charges of being “soft on Communism?” Would such an administration overcompensate by being even tougher on China? Hard to say. It wouldn’t be the first time it happened. Remember Harry Truman? Will I vote for Kerry? I’m not even sure I will cast my usual quadrennial “wasted” vote for the Libertarian Party candidate. That’s how fed up I am with the existing political paradigm. 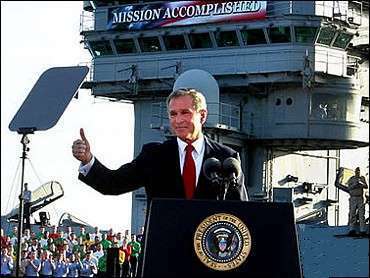 After all, we haven’t forgotten Dubya’s oh so folksy, oh so heartfelt, oh so sincere “The United States Must Be Humble” speech already, have we? That may not be what many fellow Americans, including some Chinese Americans who enthusiastically support Kerry want to hear, but it’ll have to do.